We wanted to have our own rules directly related to our core business. We already apply the client’s rules on site, but we strive to be more focused on our activities in order to maintain the highest HSEQ standards. Our goal is to address the essential issues related to the key risks our employees face during their day-to-day operations. Which is why, Dietsmann launched a 12-month HSEQ campaign focusing on 12 Safe Maintenance Rules that relate directly to the Company’s core business and address the key risks faced by Dietsmann’s employees. The 12 Safe Maintenance Rules are fully integrated into and applied during the day-to-day operations of every employee and are included in Dietsmann’s HSEQ Management System. 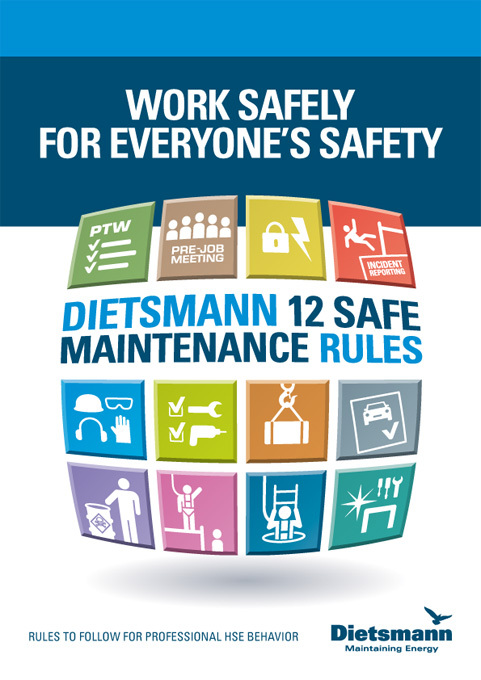 The ‘Dietsmann 12 Safe Maintenance Rules’ campaign is available in seven languages. Training sessions focusing on one rule per month were organized. A rule is an appropriate principle regulating the practice or procedure of a specific activity. Following rules is compulsory. What are the 12 Safe Maintenance Rules? 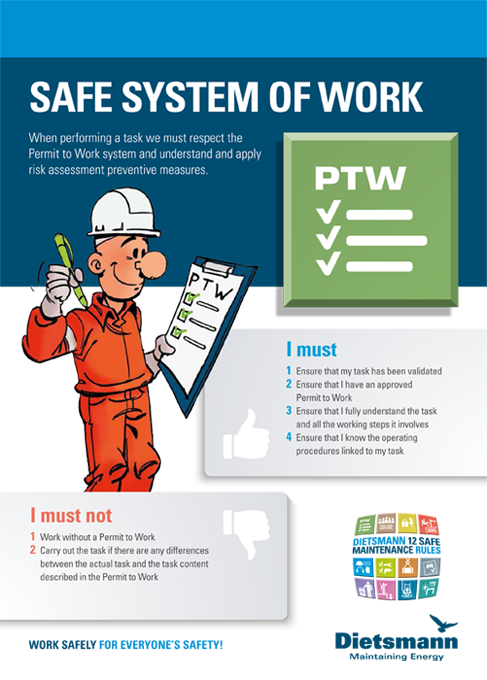 Respecting the Permit To Work and understanding and applying the Risk Assessment preventative measures. 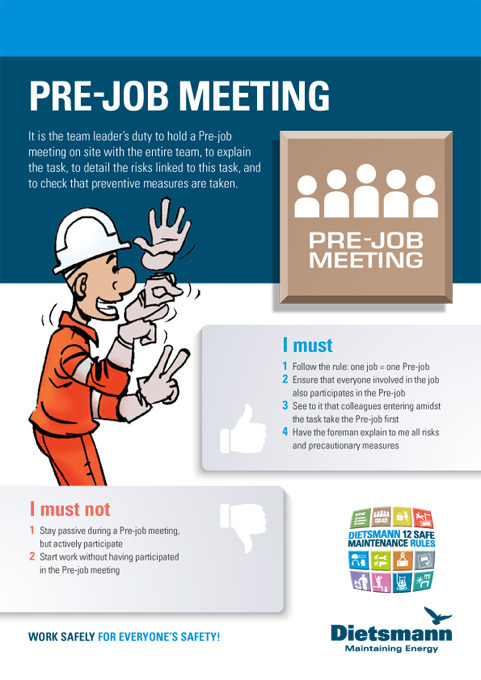 The importance of the Pre Job Meeting to ensure the entire team understands the task and related risks and all necessary risk prevention measures are in place. The importance of ensuring all isolations are in place and validated and the precautions to be applied, especially for electrical isolations with the LOTO (Lock Out Tag Out) system and mechanical isolations. Responsibilities at each level in the organization regarding reporting, from anomaly card reporting for the workforce to accident reporting to the management. 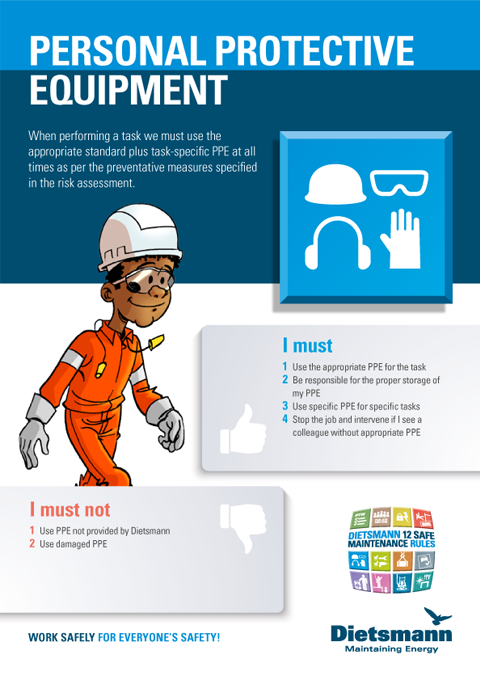 The PPE specifications and the necessity of using the standard plus task-specific PPE at all times. 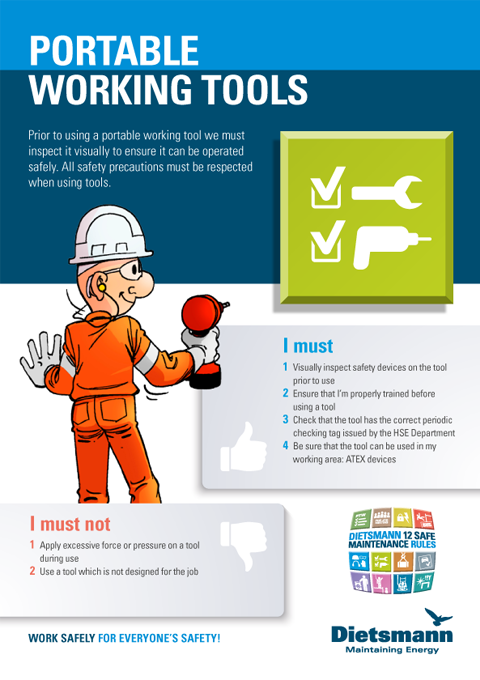 The steps to be followed prior to using a portable tool, the importance of using the right tool for the task and safety precautions when using tools. All the precautions to be applied during lifting and what to do and not do while a lifting operation is in progress. What authorizations are required, the rules to be observed, defensive driving courses and the alcohol policy. Knowing all the hazards and working safely with chemicals. Specific precautions to be applied when working and preparations for working at height including the use of scaffolding and safety harnesses. 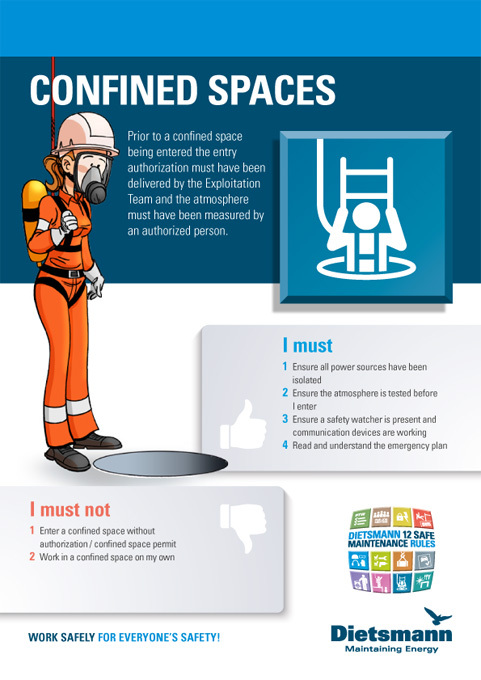 The authorizations and checks required before a confined space may be entered and specific precautions related to working in a confined space. Why working areas and workshops must be kept clean and equipment must be stored tidily. It is the Team Leader’s duty to hold a Pre-job meeting on site with the entire team, to explain the task, to detail the risks linked to this task, and to check that preventive measures are taken. 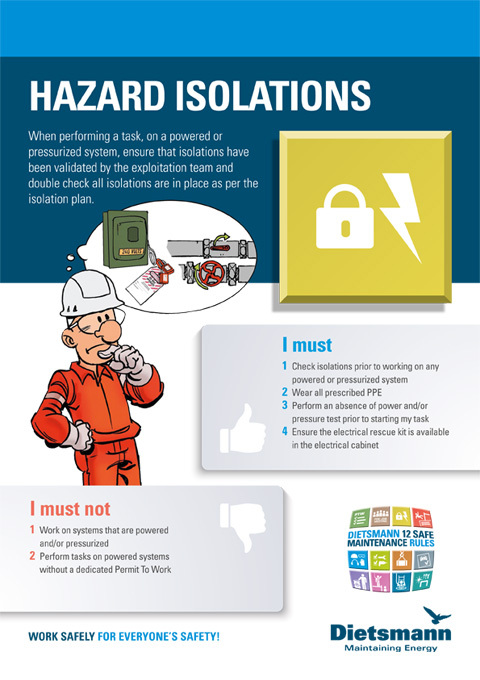 When performing a task, on a powered or pressurized system, ensure that isolations have been validated by the exploitation team and double check all isolations are in place as per the isolation plan. 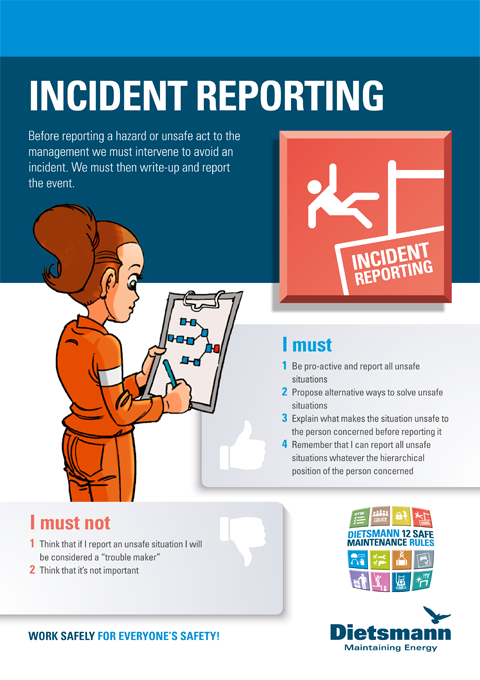 Before reporting a hazard or unsafe action to the management we must intervene to avoid an incident. We must then write-up and report the event. When performing a task we must use the appropriate standard plus task-specific PPE at all times as per the preventative measures specified in the risk assessment. Prior to using a portable working tool we must inspect it visually to ensure it can be operated safely. All safety precautions must be respected when using tools. We must be certified and authorized to perform a lifting operation. 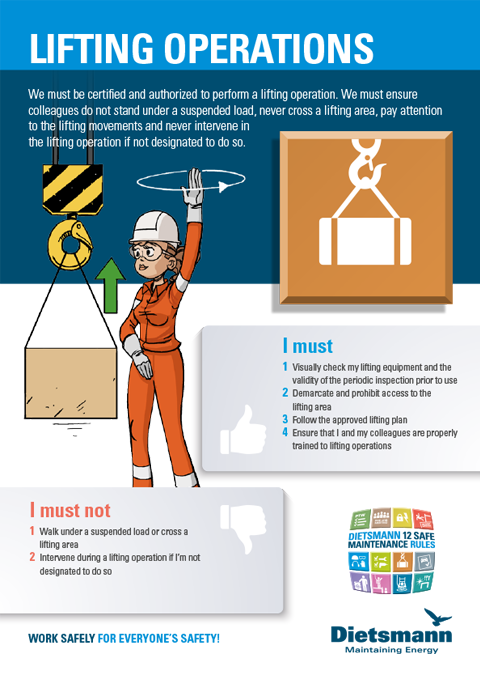 We must ensure colleagues do not stand under a suspended load, never cross a lifting area, pay attention to the lifting movements and never intervene in the lifting operation if not designated to do so. 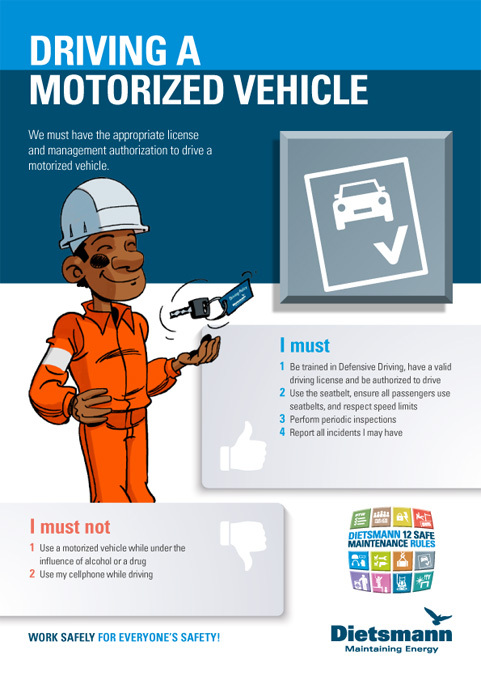 We must have the appropriate license and management authorization to drive a motorized vehicle. 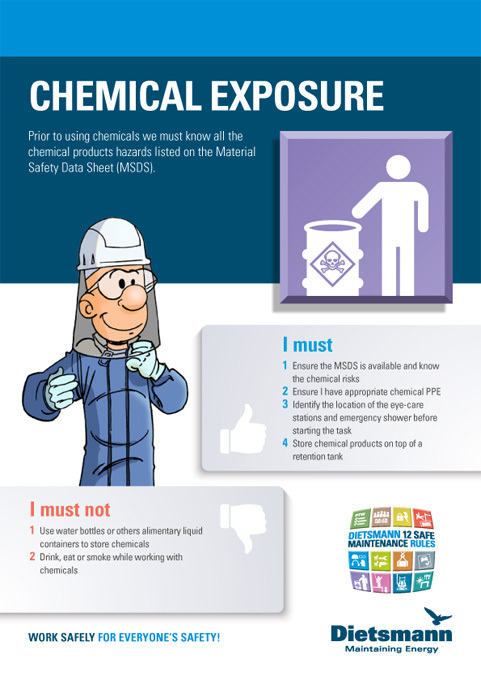 Prior to using chemicals we must know all the chemical products hazards listed on the Material Safety Data Sheet (MSDS). 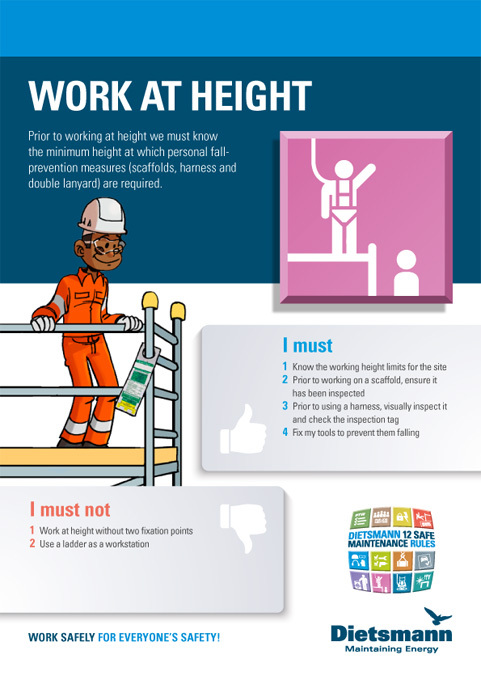 Prior to working at height we must know the minimum height at which personal fall prevention measures (scaffolds, harness and double lanyard) are required. Prior to a confined space being entered the entry authorization must have been delivered by the Exploitation Team and the atmosphere must have been measured by an authorized person. 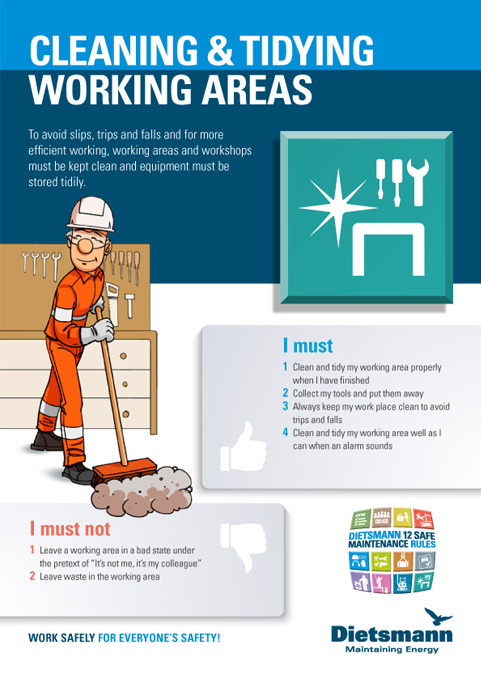 To avoid slips, trips and falls and for more efficient working, working areas and workshops must be kept clean and equipment must be stored tidily.